While I can't get my fingers in the dirt just yet, I can do a little prep work. That prep work right now is making upcycled canning lid plant markers. This is a great winter project. It helps us get ready for the garden season and makes use of those lids as we eat through our pantry stores. I generally gather my canning lids into a container for several weeks and then make the markers in a big sitting. Canning Lids – I use both wide and regular mouth lids. Obviously there's more space for writing on a wide mouth lid but don't be choosy, it won't matter. An awl or a drill – Something to punch holes into the lid, an awl works perfectly. However, if hand strength is an issue or you'd prefer a little help, an electric drill with a small bit will also work. Twine or yarn – You'll need a way to hang the markers. Garden twine works, of course, but so does bits of yarn leftover from knitting or crochet projects. Marker – A permanent marker or even a paint marker is preferable, otherwise the weather will likely fade the ink. Using the awl, simply punch two holes in each of the canning lids, just 1/2 inch apart. Do this on a workbench or cutting board so as to not mar any surfaces or tables. Thread yarn through the holes, leaving a long tail. The tail is important because this is how the marker gets attached in the garden. Write the name of your plant variety on the white part of the lid with the permanent marker. Tie the loose ends of your twine around stakes, tomato cages, trellises, etc. to keep track of your plant varieties. I use bamboo stakes at the beginning of each row for things that don't need support. 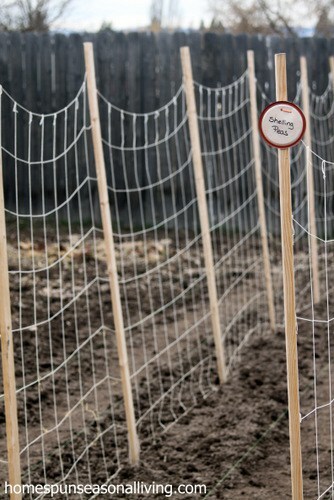 Things like tomatoes or peas that have trellising, simply get markers tied to their supports. 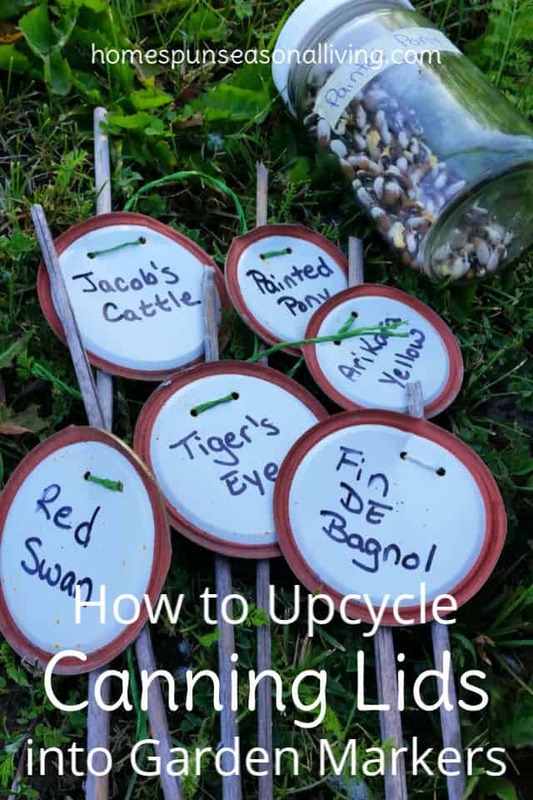 If you're interested in using canning lids as plant markers but don't want to use an awl to punch holes or allow it to be a project safe for kids, check out this tutorial from Untrained Housewife. 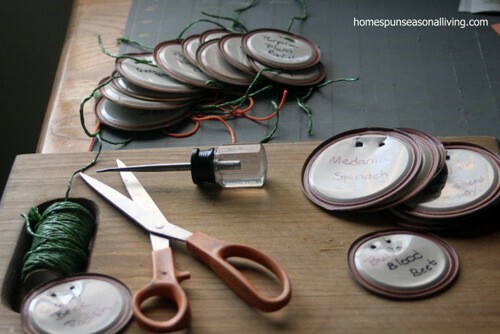 As you're eating your way through your pantry, I hope you'll consider saving those lids and making some upcycled canning lid plant markers to keep track of all those amazing plants in your upcoming garden! Have more canning lids than you need for the garden? Make upcycled gift tags from those canning lids! I always get my labels ready ahead of time too. It’s nice to have a “gardening job” to do when it’s too early to actually be planting. Plus, it saves time when the busy season arrives! NIce idea – thanks for sharing. What a great way to reuse the can tops! I’ve been looking for ideas like this because I have so many leftover. Thanks for the inspiration! What great ideas! Such fun, thank you for sharing. Wow. I didn’t know what to do with those canning lids. Do they rust outside? They will rust eventually but it usually takes at least 2 years for that in my experience and that includes leaving them outside in the snow. What a great idea! I always wonder what I could do with those. It’s such a simple thing but fun. That is such a clever idea! I’m gonna remember to do that with my empty jars that sit in a garage until needed!